The House of Cartier was founded in 1847 when the 28-year-old Louis-François Cartier took over a shop at 29 rue Montorgueil in Paris. His son Alfred took control of the company in 1874, by which time it already had an excellent reputation. However, it was Alfred’s three sons — Louis, Pierre and Jacques — who would go on to establish Cartier as a world-famous jewellery brand. While Louis retained the responsibility for Paris, in 1902 Jacques went to London and only two years later received the Royal Warrant, thereby supplying jewellery to King Edward VII and his court. Pierre travelled to New York where, in 1917, he famously acquired 653 Fifth Avenue for two strands of the very finest pearls. This piece of prime real estate remains a flagship store to this day. Since then the Maison has expanded globally, becoming what many consider to be the finest jewellery house in the world. Its clientele has encompassed royalty, film stars and business tycoons. King Farouk of Egypt, The Duchess of Windsor, Elizabeth Taylor, Grace Kelly and Clark Gable all made their way to Cartier to buy or have their jewellery made. The famous Cartier ‘three-ring’ made its first appearance almost 100 years ago, in 1924, during the Art Deco craze. It was designed by Jean Cocteau, the French writer, painter, filmmaker and poet, who was a great friend of Louis Cartier. The simplicity of the three interlocking rings, each of a different gold colour, quickly became a classic. It seemed appropriate that this ring, which supposedly symbolised friendship, fidelity and love, should be a favourite among jewellery collectors. It is also to be noted that the technicality of the 'Trinity' models, as simple as it may look, is an incredible feat, allowing the three bands to slide smoothly over the skin. In 1914 the first ‘Great Cat’ motif entered the Cartier family by means of an onyx-spotted panther pattern wristwatch created by the famous French designer Charles Jacqueau. Through the years, the initial pattern has evolved to fully sculptured animals, and the array of cats has widened to include the striped tiger as well as the panther. Promoted to Director of High Jewellery at Cartier in 1933, Jeanne Toussaint, a feline-lover who was nicknamed ‘The Panther’ by Louis Cartier and her colleagues, immediately took the responsibility for supervising the ‘Great Cat’ designs. Together with the outstanding creativity of designer Peter Lemarchand, she produced a variety of jewels which forever immortalised the feline motif within the context of Cartier design. 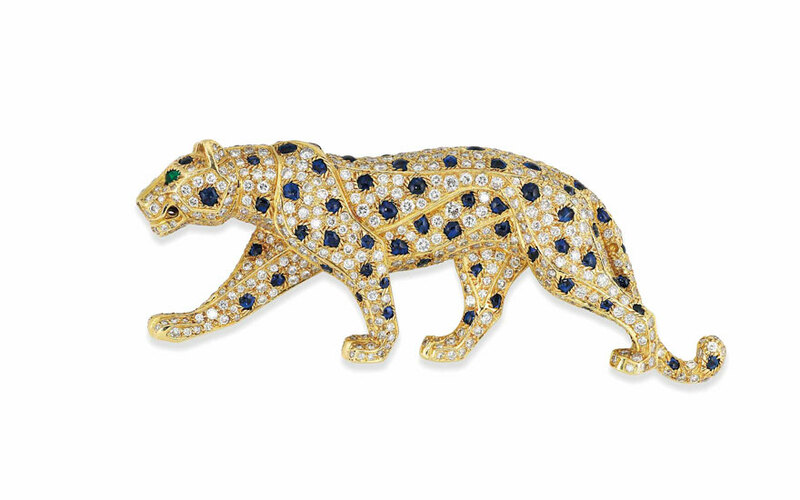 After the first three-dimensional panther was created in 1948 for the Duchess of Windsor, famous Cartier clients regularly fell in love with the jewels. Daisy Fellowes and Nina Dyer, for example, both appropriated this new look. American heiress Barbara Hutton, notable style rival of the Duchess of Windsor, was also famous for her preference for Jeanne Toussaint’s tiger menagerie. During these hundred years of design, the iconic Cartier cats have gone through multiple variations but they are still considered today as a must-have for jewellery collectors. New designs from the 1980s and 1990s have only furthered the demand for these rare and spectacular jewels. Cartier has always been at the forefront of change and innovation. Jacques Cartier first visited India in 1911 and, through his buying agents in Delhi, Calcutta and Bombay, managed to acquire Indian rubies, sapphires and emeralds, carved with floral motifs, at modest prices. The workshops in Paris assimilated Indian designs into a new style of multi-gem jewels, far removed from the typical severity of purely diamond-based Art Deco jewels, and that would be known by the name of ‘Tutti-Frutti’ style. The genre reached its crescendo with a stunning piece, the ‘Hindu necklace’, which was commissioned in 1936 by the heiress to the Singer sewing machine company, Daisy Fellowes. Aldo Cipullo joined Cartier, New York, in 1969 after serving an apprenticeship in his native Italy, and later at David Webb. Within two years he had created two of the most iconic Cartier designs: the ‘Love’ and the ‘Juste un Clou’ — minimalist, whimsical, and ingenious. The ‘Love’ bracelet, a band in two sections, has to be screwed together with the aid of a screwdriver — provided by Cartier of course. Once in a place, the bracelet is not to be removed! In a brilliant marketing move, Cartier made the decision to gift his-and-her love bracelets to the most famous couples of the era, including Elizabeth Taylor and Richard Burton and Steve McQueen and Ali McGraw. A symbol as strong as the eternity ring itself, the ‘Love’ bracelet has been, for more than 40 years, a token of love and attachment. What’s not to love when you combine incredible craftsmanship, timeless design and a bit of magic? Very much inspired by the Magic Clocks of famous 19th-century illusionist Jean Eugène Robert-Houdin, Maurice Couët, a young clockmaker at Cartier, astonished the industry by exploiting the same illusion, but in a traditional clockmaking way, creating the first ever ‘Mystery clock’, named ‘Model A’, for the Maison in 1913. Hands ‘floating’, no mechanism to be seen, the magic trick of these clocks fascinated Cartier clients and sales staff alike. The Mystery clocks created by Cartier during the Art Deco period blend exquisite craftsmanship, elegant design and the most technologically advanced mechanisms, resulting in works that continue to entertain and mesmerise the observer with their illusion and beauty. King Edward VII of England used to refer to Cartier as ‘the jeweller of kings and the king of jewellers’. This reputation was such that at the coronation of King George V in June 1911, 19 of the tiaras worn at the ceremony were by Cartier. From Spain to England, Belgium to Russia, India to Siam, Kings and Queens around the world made Cartier their official supplier of royal jewellery. Socialites and movie stars followed suit and Merle Oberon, Elizabeth Taylor, Grace Kelly and Gloria Swanson were all great collectors of Cartier jewellery. Even the most discerning of diamond collectors would go to Cartier to have them mounted. Such was the case of Salomon Barnato Joel, who had made his fortune in the South African diamond mines, being the director of Barnato Brothers as well as De Beers Consolidated. In 1912, he asked Cartier to mount four of his best diamonds. Cartier created an outstanding stomacher or devant-de-corsage brooch, so fashionable during the Belle Epoque. Designed around a central pear-shaped diamond of more than 34 carats, two navette-shaped diamonds and a heart-shaped diamond, this devant-de- corsage is a great example of the subtle and delicate ‘Lily-of-the-Valley’ setting used by Cartier around 1910 and mastered by their famous workshop ‘Atelier Henri Picq’ in Paris. Up to this day, Cartier remains a favourite amongst great jewellery collectors and royal families. As an example Catherine Middleton, now Duchess of Cambridge, chose to wear the Cartier Halo diamond tiara for her wedding to Prince William in 2011.